– Combine 2 tablespoons of ground flax with 6 tablespoons of warm water in small bowl. Mix well and refrigerate for 20 minutes. – Combine dry ingredients in a large mixing bowl. Add 2 cups of water, 1 teaspoon of vanilla, and flax egg mixture. Stir well. – Refrigerate batter for one hour. – Heat a 9 inch non-stick frying pan over low heat adding enough coconut oil to lightly coat the pan. – Pour 1/2 cup of mix into pan at an angle, spreading batter out using circular spinning motion. If batter is too thick add additional water to mixture one tablespoon at a time. 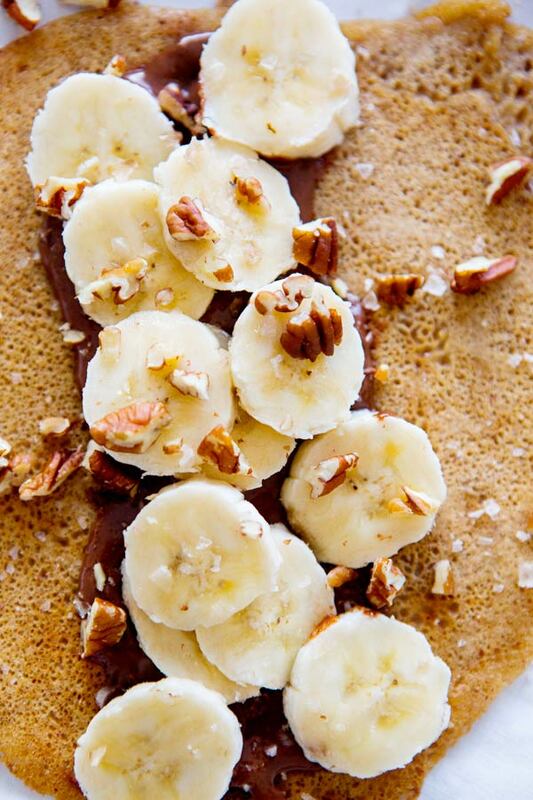 – Cook on low heat for 1-2 minutes or until crepe is evenly browned and edges start to peel away from sides of pan. – Gently flip in pan and cook for an additional 1-2 minutes. – Repeat until all the batter is used up. 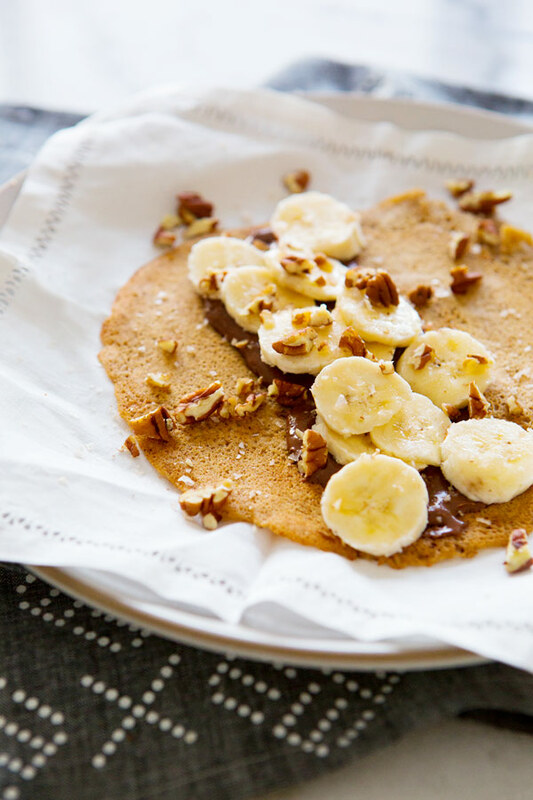 – Smear chocolate hazelnut spread in a strip on the center of the crepe and top with sliced bananas. – Sprinkle with finishing salt, roll up, and use hazelnut spread to secure ends if needed. OMG I want these so badly right now!!!! 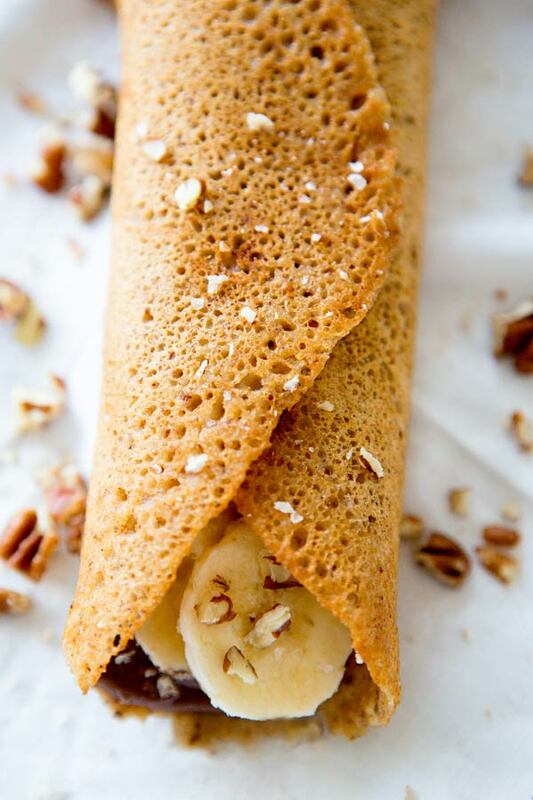 I don't need to be vegan or gluten free, so I had no idea how hard pancakes would be, so well done and congratulations on finally getting these right, because they look fantastic! I haven't had crepes in a while and I haven't made them in even longer! These look amazing – I'll definitely need to whip these up soon! Lucis Morsels fashion. food. frivolity. oh my. these look divine! Would this work as pancake batter as well? Holy yum these look amazing! PS – I am a new reader of your blog and I am absolutely loving it. I enjoy your writing style and the beautiful photos. I used to be really good at making crepes! Maybe I should try again. Is there no end to your culinary prowess? I mean really! This is incredible. Very excited to try my hand at these. And pair them with mimosas, obviously. I love these, I used to make crepes all the time and after you get the hang of it, it's really quite easy. being gluten free, I'm always on the look out for a great recipe! these look so yummy, I'll have to try them out. I so want to make these! do you think I could substitute the oat flour?? oats don’t really agree with me! What is flax egg mixture? Just wondering if it would be possible to make the batter the night before? Do you think it would stand well in the fridge overnight? Hi! I was just looking at this recipe and in the instructions you mention a “flax egg” mixture? I don’t see eggs in the ingredients? Help! oh nvm i believe you must mean that the flax mixture is the egg substitue, duh! LOL! A flax egg or a half cup applesauce are substitutes for an egg ! Wouldn’t easier to flip it into another pan next to it and start a second crepe? A flax egg is one Tbs. Flaxseed meal to two or three Tbs. water. Thank you for the recipe! I just want to know if the crepe is crispy or soft?